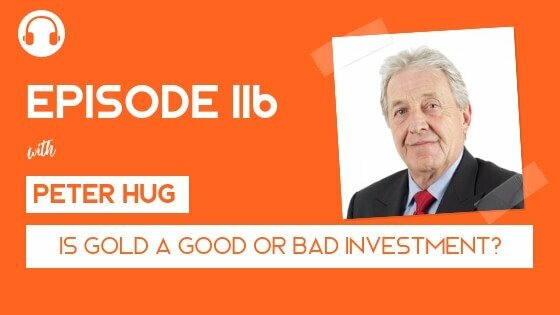 Peter Hug has been in the gold industry for nearly 40 years which makes him an expert in my opinion when it comes to gold. Now to be honest, I am not a fan of gold (yet). In fact, I have never once invested in gold because I have personally never liked gold as an investment. So, why am I willing to learn more about gold now, right? First off – I don’t know much about gold. One of my rules is I do not invest in things I don’t understand. Therefore, investing in gold was never something I was comfortable doing. Secondly, (I thought) gold didn’t have a great track record when compared to the equity markets. From what I do know, the the price of gold has increased by 355% over the past 30 years, while the Dow Jones Industrial Average has increased by 1,255% during that same time frame. But, now I am also learning that over the past 15 years, gold has outperformed the market. In fact, gold has returned 355% over the last 15 years (same as the 30-year return) while the Dow has returned only 58%. After seeing the facts, I decided to ask Peter to come on the show to see if he could convince me gold was a viable option. Here are some of the takeaways from my interview with Peter. How much gold should you invest in? A family friend introduced me to precious metal streaming stocks like Wheaton (WPM) and Franco-Nevada (FNV). They collect royalties from gold miners and other precious metal projects. I have small positions in these two stocks and the GLD gold ETF. This partially to get exposure to the precious metals market and as a “chaos” hedge. The year 2018 hasn’t been kind to any of these stocks, so it’s a long-term position for me. I’ve only been investing money I can afford to lose because precious metals have been lackluster of late. That’s probably a good way to look at most investments, Josh! Peter Hug always seems to be a highly experienced and seasoned person in the precious metal markets with a kind of quite detached or impartial view. He’s been in the precious metals market for so long and I think they hired him for that huge experience. I like his impartiality even though he is in that particular business. I’ve looked at Kitco every week for about 15 years as sort of a goto site for commentary. Gold/Silver/other PMs will never go to zero. All stocks, bonds, currencies could go to zero. I have owned several stocks over the years that have hit zero (and they can get there fast). You can purchase PMs in any amount you can afford. PMs are available to everyone, with no minimum buy-in threshold. Inbox Dollars Review: Here’s What You Need to Know Before You Start Is Survey Junkie a Legit Side Hustle?